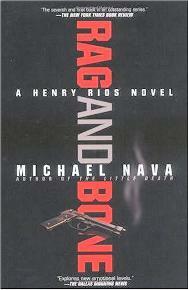 Back in 1986 Michael Nava published his first novel to feature the West Coast American lawyer Henry Rios. Over the following years Henry Rios has featured in seven novels, by Michael Nava, and all of them have been highly readable and enjoyable. But Henry Rios is not the clean-cut, all-American male lawyer, who breathlessly solves murders. Henry Rios is a defense lawyer, who usually defends the under-dog, but that is where the similarities end. Henry Rios is Mexican, from a forcefully working class family and is gay. Ghosts of a macho-abusive father and a pathetically Catholic mother constantly haunt him. For many years he was estranged from his lesbian sister (his only living relative). He is an Aids-widow, having found and then lost his lover to Aids over the course of these novels. His out-spoken views have made him as many enemies as friends. This man has enough emotional baggage to fill an SUV. This man is a real character. He is everything Perry Mason isn't. Rag and Bone is the last Henry Rios novel and so I started to read it with a heavy heart, so much had I enjoyed the previous novels. But this is a novel with which Henry Rios leaves the literary world on a high note. Rag and Bone opens with Henry Rios collapsing, in court, with a heart attack. While he is recovering from this, slowly re-gaining his confidence, he repairs his fragile relationship with his sister, Elena. This leads to Elena telling him she had a child, while in college not yet come to terms with her sexually, which she gave up for adoption. Later, when Henry Rios is home, his newfound niece and her young son turn up on his doorstep. She is on the run from the police, who want her for the murder of her husband. As Henry Rios takes on her case he also meets a man, John, a builder who was once married, with whom he starts a tentative relationship. The main thrust of this novel isn't the murder Henry Rios investigates, that certainty takes second place to the main themes, which are the mid-life change Henry Rios makes following his heart attack. This novel is also about Henry Rios building a family around him - not the apple pie propaganda of the far right but real life family. Henry Rios also becomes a subistute father for his great-nephew. Michael Nava sensitively and very insightfully writes about a middle aged gay man finally coming to terms with his life and exercising the ghosts of his past. He writes with great insight about Henry Rios' heart attack, not just the mechanical medical details but also how it changes a person's priorities right around. He also explores what it means to be a father-figure/role model for a young child. Not least are the complex and alive relationships in this novel, they are more then mere plot derives, from Henry Rios' re-building those with sister and niece, emotional mine-field with his great-nephew and the tender but no less easy relationship with his new lover.